Walking canes, also known as assistive canes or walking sticks, are a form of mobility aid that redistribute weight away from injured or weak lower limbs. The basic cane is made up of a handle for a comfortable grip, a collar to connect the handle to the shaft, the shaft for transmitting weight load, and the ferrule (tip) for being a tactile interface that adjusts to the ground surface. Outside of injury and assisted general support and movement, canes are often used for a variety of needs that include aging, multiple sclerosis, cerebral palsy, arthritis, diabetes, and other conditions. Fit, comfort, and safety are paramount for the effectiveness of a cane and the first step to accomplish these goals is correctly fitting a cane to a person. 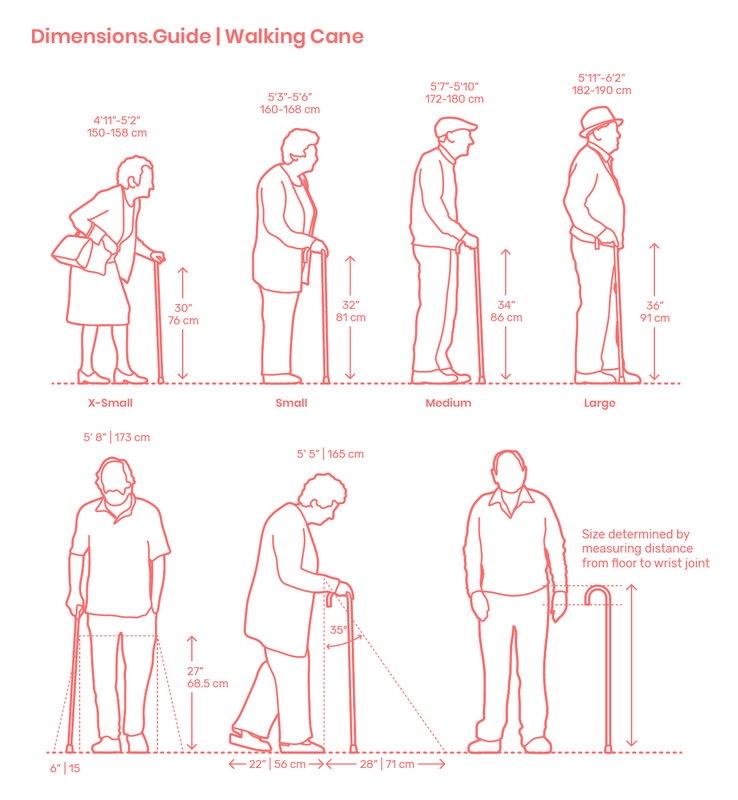 To size a walking stick for an individual, measure the distance from a flat floor surface to their wrist joint while they are wearing standard walking shoes. From this dimension, round down to the nearest size available or place a custom order. Another simple way to estimate cane length is to divide an individual’s height by two and find the closest cane size within 1” | 2.5 cm from this measurement.